Seventy miles per hour powerboats will roar into Scarborough at the end of this month when a major international race series comes to the town. The P1 SuperStock group of racers will be competing off the coast on May 29, 30 and 31. Powerboats were last in the town in 2008 when the Thundercat racers held a two day event out of the harbour. As part of the race weekend a jet ski championship will also be taking place. Robert Wicks, P1 chief operating officer, said: “The P1 Scarborough Grand Prix of the Sea will be a double bill of fast, furious and free-to- watch racing at South Bay over the weekend of 30th/31st May. If sea conditions are favourable, race organisers plan to reach a wider audience by extending the practice session to take the racers south towards Filey. 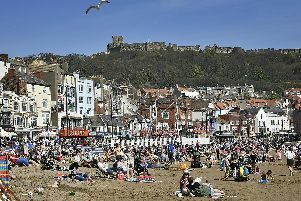 Cllr David Chance, Scarborough Borough Council Cabinet Member for Tourism and Culture, added: “We are absolutely delighted that Scarborough has been chosen by P1 for its season opener in 2015. The SuperStock race courses are close to shore, tight and fast, making it a great spectacle for the public and equally demanding on the drivers and navigators. Up to three races are held over a race weekend lasting around 20 minutes each. Local company Dale Power Solutions has signed on to be the headline sponsor of the event. The powerboats were in town over the Tour de Yorkshire weekend to promote the upcoming race and it is hoped that it could be the second successful sporting event in Scarborough inside a month. More than 250,000 people came out to watch the cycling race from Bridlington, up to Whitby and down to Scarbrough. Whilst crowds of that size will not come to see the powerboats, organisers hope for a great turnout for what could become a regular race.